Hold yourself accountable while training for your backcountry bowhunt. Put your fitness to the test by entering a timed race. Fitness goals are easier to achieve when there is light at the end of the tunnel. But sometimes you have to create the light, and that’s where entering a race comes into the game plan. This approach makes goals concrete, official. So here’s how to create your own “light” at the end of a bowhunter’s much-anticipated, hunting preseason. Nothing motivates you and boosts your training more than signing up for a physical fitness competition. Earlier this month, I participated in the 39th Annual Pueblo Chieftain Spring Runoff. It’s a great race with over 700 participants. The race schedule allowed me to chose between a 5K, 10K and 10-Mile. Based on my training and long-term hunt goals, I picked the 10-mile. Though I’ve run the race many times before, I had a specific finish-time goal in mind, and this gave me something to push toward during training. I wanted to run the race in under 1:13:00, which I did. I finished in at 1:12:36 – good enough for second place overall in my age group. As soon as I inked the race date and time on my calendar, I created a new light at the end of the tunnel, and I trained hard to reach my goal. In addition to giving you more time to train and reach your personal goal, there’s often a discount for signing the dotted line early. Don’t wait to register. Make the decision and get it on your calendar. Look for running events to register for at www.runningintheusa.com and www.ultrasignup.com. I’ve talked throngs of new-to-running individuals into signing up for their first race, and they all spew out the same worry before entering their credit card info — I just don’t want to finish last. Here’s the thing. If you pick a known race that draws a crowd of runners and put in your training time, then I promise you won’t be the last runner to cross the finish line. Also, be sure to pick a race you know you’re prepared for. A simple 5K (3.1 miles) is a great for the first-time racer. This advice has never failed me. Take this past weekend in Pueblo. I talked to five people who simply walked the entire 5K course. Others ran/walked the 10K course. If you put any amount of training in, coming in last should be the furthest thing from your mind. I get it. Not everyone is a runner. The good news is that you don’t have to be to compete. You can enter a road cycling race, mountain bike race, IRONMAN Triathlon, Train to Hunt or the Alpha Bowhunting Challenge. Take a peek at the websites below to get your other-than-just-running competition groove on. 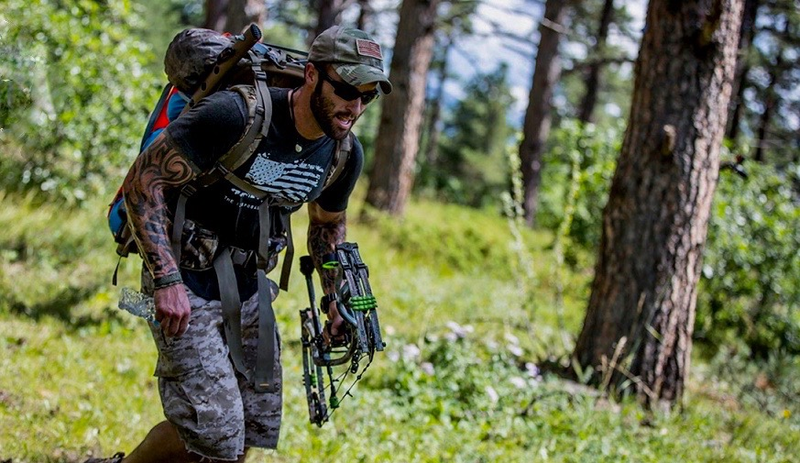 Backcountry bowhunting essentially requires bowhunters to get fit. But any type of bowhunting or hunting endeavor can be used to motivate outdoorsmen and women to improve stamina and endurance. For more “Fit Bowhunter” posts, click here.